Raymond “Ray” Peterson, 85, died Tuesday, October 9, 2018, at CHI St. Alexius Health Carrington Medical Center surrounded by family. 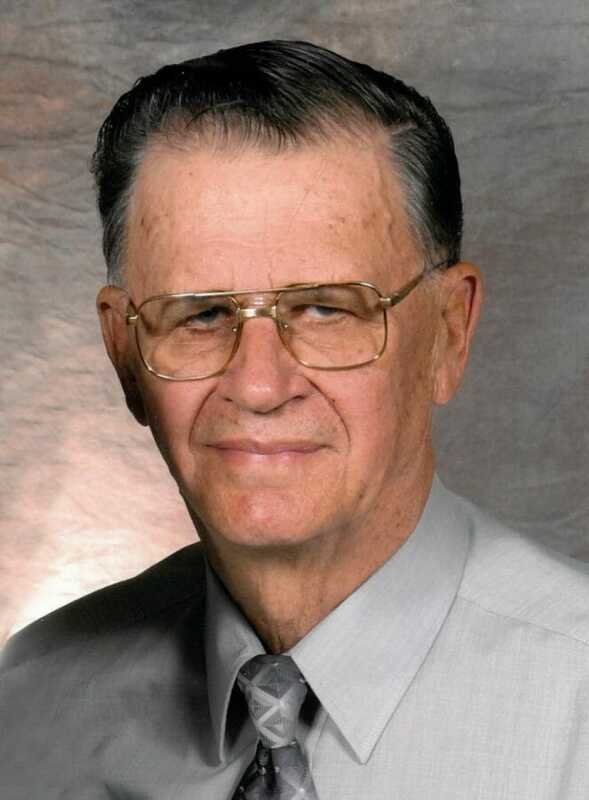 Raymond Lyle Peterson was born on June 9, 1933, the son of Martin and Lela (Filbert) Peterson in Ellendale, ND. Ray graduated from Ellendale High School in 1951. He served in the U.S. Army from March 1955 until March 1957, completing his basic training at Fort Knox, KY, before being sent to Korea. While there, Ray visited his brother, Bob, who was serving in the U.S. Air Force in Japan, for a five-day leave. Ray was surprised to be set up in a private room with three hot meals a day – a special treat and reprieve from living in a tent in Korea! Ray married Lois Husby, on August 31, 1958, at Zion Lutheran Church in Ellendale. Ray worked in the parts department for Quality Chevrolet in Ellendale until January 1967, when he joined Rydell Chevrolet in Grand Forks, ND, as service manager. In April 1975, the family moved to Carrington, ND, where Ray was the parts and service manager for Jim Vetsch Chevrolet, later Bessette Motors, until retiring in 2000. During his retirement years, Ray enjoyed driving a school bus filled with children’s stories and laughter on his daily route. Ray was a sports fan and enjoyed the outdoors. The television or radio was usually tuned to Minnesota Twins baseball or Vikings football. He faithfully applied for an annual deer license, allowing him more quality time with his son and grandchildren. Ray and Lois traveled frequently, often in the company of their daughter, Cheryl, including numerous trips to Branson, MO, the Pacific Northwest and Montana to see family, a New England bus tour to celebrate their 50th wedding anniversary, and a special family cruise to Alaska in 2011. Ray was a member of the VFW and American Legion, and served on the Trinity Lutheran Church council in Carrington for a time. A man of quiet strength, Ray loved nothing more than to be amongst family and good conversation. He had the honor of walking his only granddaughter, Nellie, down the aisle. In recent years, he cherished the sweet moments spent with his four great-grandchildren. Ray’s family will miss his love and warmth on this earth, but are comforted knowing he is now at peace, relishing in the joy of a much-anticipated reunion with his son, Keith. Ray is survived by his wife of 60 years, Lois; daughter, Cheryl Peterson, of Carrington; daughter-in-law, Julie Peterson, of Robinson, ND; three grandchildren, Dustin (Kristin) Peterson, and their children, Dylan and Everett, of Robinson, Darin (Cally) Peterson of Steele, ND, and Danielle (Mike) Wachter, and their children, Owen and Kylie, of Steele; brother, Robert (LaVonne) Peterson, of Grand Forks; and many nieces, nephews and dear extended family members. He was preceded in death by his parents; his only son, Keith; sister, Carol Jean Peterson; and brother, Melvin Peterson. Visitation will be Friday, October 12, 2018, 9-7:00PM followed by a Prayer Service at 7:00PM all in Evans Funeral Home, Carrington. Funeral Service will be held Saturday, October 13, 2018, at 10:30AM in Trinity Lutheran Church, Carrington. Burial will be at the Ellendale Cemetery, Ellendale, ND. Lois, Cheryl and Family. Our sincerest sympathies on Ray passing. He was a very kind, wonderful man. Lois, Cheryl and the rest of Ray’s family, Jim and I send our love and prayers for you during this time. The loss of a loved one is so hard to comprehend, that at times the words of sympathy feel empty. Please know Jim and I wish we could be there with you, but since we cannot we wanted you to know we are thinking of you in your time of grief. Try to rely on your Faith in a Loving and forgiving God! Allow the hands of God to hold you as you are comforted by family and friends. Lois and Cheryl: You have our sympathy for your husband and Dad. Know he will be missed greatly. Bless you and all the family. Sorry to hear of Rays passing. We were great friends when he worked at the Chevy garage. Ray was a great guy. May God hold you close and give you the strength you will need as for grieve this great loss of Raymond. May your memories bring warmth to your heart and smiles to your face. When the tears come, let them flow and know that God sees and feels your pain. He is with you at all times and will help wipe your tears. Please remember the Pastor’s serman….He is the I AM…..He is with you always and through Him, you will be reunited with Raymond, but until that time, let God’s promise’s bring you comfort and peace. Lois and Cheryl, I love you. I am here for you at any time and for any need.